I got a call from my daughter that my granddaughter was in an ambulance. She was not breathing. She was brutally shaken and her breath was squeezed from her lungs leaving her body limp and her heart racing. She was ten months old at the time. Now, five years later, that little girl is almost six. 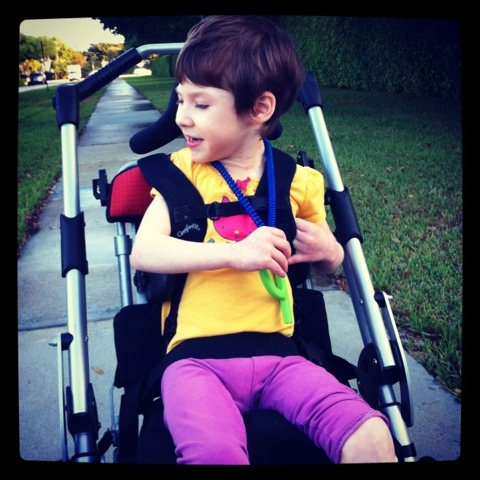 Her injuries that night left her with cerebral palsy. She is a quadrepelegic. My wife and I adopted her. Allie is our daughter now. She is the center of the universe. Five years have brought a tremendous amount of healing into our lives. Many people have stood with us in prayer and God has been faithful to answer those prayers. God is good all of the time. I was asked recently, after giving a talk, about forgiveness. Have I forgiven the young man who did this? Talk about forgiveness dredges up painful memories. Extending forgiveness to someone that's flipped our lives upside-down has been difficult but not as difficult as you may think. Self-preservation is elemental in extending forgiveness. My wife and I learned that we couldn't heal and partner together to care for Allie unless we let go of the offense that ruined so many lives. There's no going backward to fix this. We could either exist in survival mode or we could trust that the Lord is up to something that can only be used for good. We can't hold onto our pain with closed fists and expect to receive anything good from God because to receive from Him you have to hold your hands open to Him. We needed to receive from Him because that is the only way that horrible can become amazing. My wife is amazing. For Christmas, my wife bought the young man who did this a Bible. She couldn't mail it to him because he's in prison and is not allowed to receive mail from individuals, but inmates are permitted to receive packages from Amazon.com. So the Charming and Beautiful Susan ordered him a Men's Devotional Bible and a couple of other Christian biographies. When he received them, he wrote us a nine page letter thanking us and asking for forgiveness and the possibility of building a relationship with him someday. Relationships matter more to God than the pain we've inflicted on each other. Justice isn't only punishment. Lady Justice stands, blindfolded, holding scales. She doesn't hold instruments of punishment. Justice is about bringing things into balance. Punishment and paying a debt to society are often part of bringing things into balance. But it is only a small piece of what the Lord intends for making things right. I'm thankful that what Satan meant for evil, God used for good. We're honored to be your friends, and we love Allie to pieces. Thanks Luann. Plase don't move. Can we come with you? Nice post i am so grateful for your post and I cannot thank you enough for the blog. Really thank you! Fantastic.thanks. I've followed your blog since well before the accident. I have prayed for you all so many times over these years. I still can't read any of your post about Allie without crying. This one is so beautiful. Forgiveness is such a supernatural gift that we have to walk in. Thanks for posting this.